Imagine you are sitting in Mass. During the sign of peace, you wave to your friend across the crowded sanctuary and shake hands with the fidgety kids in the row behind you. Suddenly, the congregation breaks out in gasps. Amid the confusion, you learn there is someone outside shooting at the building with a firearm. Imagine, too, that this is not an isolated incident. Across the country, many churches have been vandalized in anti-Catholic attacks. You have also heard about harassment, assaults and even murders of your fellow Catholics. All the while, political candidates have won elections by proposing to ban Catholics from the country, and the news is filled with overwhelmingly negative coverage of your religion. In the back of your mind is the knowledge that the government and police are keeping a special eye on your community, not just at airports but in churches and restaurants owned by your relatives. For Muslims in the United States, these scenarios are not hypotheticals; it is their reality. In 2015, hate crimes against Muslims jumped 67 percent from the previous year, according to the Federal Bureau of Investigation, reaching a post-Sept. 11 high, and the number of anti-Muslim physical assaults was on par with 2001. I know people whose mosques have been burned down, whose children have been bullied at school and who have been harassed on the street because they wear a headscarf. In our political discourse, Muslims are a convenient scapegoat. They and their religion are cast as the source of terrorism and a threat to American values. So it is no surprise that Muslims have been profiled by law enforcement and that many Americans approve of discriminatory policies. It should not be difficult for Catholics to acknowledge the reality of Islamophobia and its impact on our fellow Americans. In previous generations, Catholic immigrants were considered a threat to American values—foreigners and papists who wanted to impose religious law on the United States. Many Catholics seem to have forgotten (or have never learned) this history. According to research conducted by the Bridge Initiative, where I work, three in 10 American Catholics admit to having negative views of Muslims. Only 14 percent say they have favorable views of the group. Other polls have found that a majority of Catholics believe Islamic values are at odds with American values; almost half of white Catholics agree with banning Muslim immigrants from the United States. Catholics must critically examine their own prejudices and stereotypes of Muslims. Pope Francis has called on us to not generalize about Muslims, to avoid conflating Islam with terrorism and to stop spreading misinformation. 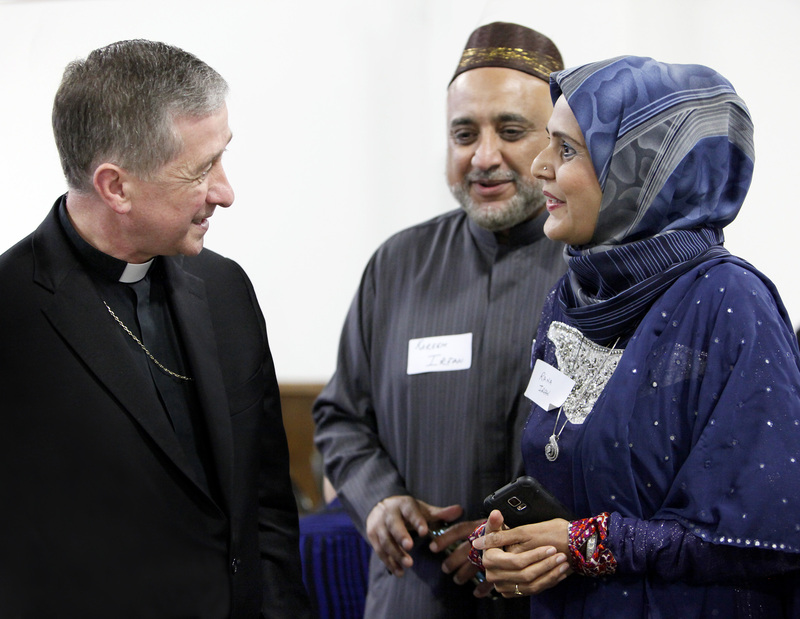 We must have the courage to charitably confront Islamophobia in our communities, our Catholic institutions and in ourselves. Our faith also compels us to reach out to Muslims in love and hospitality. Simply striking up a conversation with a Muslim colleague, neighbor, classmate or parent at your child’s school can go a long way. Invite them to get coffee or organize a playdate with your kids. If there are not any Muslims in your immediate circles, work with your pastor and parish leaders to extend an invitation to a Muslim guest speaker from a nearby mosque or university. Parishes making a public statement of solidarity, whether on a sign outside the church or an online forum, can be a meaningful first step. The most important thing is to let the Muslim community know you want to be supportive; then, ask them how you can help, whether by hosting a dinner at your church, holding an educational event or organizing a joint community service opportunity. The best ally you can be is the one your new Muslim friends need you to be. The author seems to unaware of just what Islam entails. It is quite different from any form of Christianity so the example given at the beginning is not relevant. Islam is incompatible with Western culture and Christianity. We should be compassionate with Muslims who can be very decent people but should try to settle any refugees in countries that are fundamentally Muslim. To learn about Islam, there are several excellent sources by Catholics. Here are three good ones. Inside Islam: A Guide for Catholics: 100 Questions and Answers - one of the authors is Catholic convert from Islam and has an introduction by a Jesuit. Any religion that claims ownership of the Absolute Truth is incompatible with other religions claiming the same. In such circumstances, we can expect very nasty results. However, being Catholic -- from Greek katholikos, from phrase kath' holou "on the whole, or in general, "universal" -- we cannot be excluding others from our embrace. Muslims and Catholics can live together in peace as happened for many centuries in Spain. Please do not stir even more the flames of "holy war." I suggest you read/listen to the resources I provided. No other religion besides Islam advocates the killing of those who do not believe in their religion. Islam is not just a religion but a political and social movement that controls all of life. The Holy War comes from one direction. I am suggesting the compassionate solution. Spain is not a good example. Islam early on found a means to economic and political success as they conquered northern Africa. Exploit their non Muslim subjects to work for them while preventing anyway for them to rule or defend themselves. They were essentially indentured servants unless they converted to Islam. This gradually led to conversion to Islam of these subjects for economic reasons but ironically to economic decline as there were no more servants to support the Caliphate. In Spain there was an early on revolt from the Northern part of Spain which was unconquered. It gradually after 4-5 hundred years expelled the Muslims from Spain and Portugal. By the mid 1200's Muslims were essentially gone except for their fortress at Granada. Again I suggest you make avail of the resources I listed. There are certainly others but these are good.
" No other religion besides Islam advocates the killing of those who do not believe in their religion. Islam is not just a religion but a political and social movement that controls all of life. " Have you read by chance the great stories of the Old Testament? Have you read about the killings of Christians against other Christians deemed heretics in the early centuries? Do you know anything about the Crusades or the Spanish Reconquista? Have you read about the Inquisition, Spanish and other countries', and the religion wars of the XVI and XVII centuries, and the witches hunts in England, Germany, Holland and even here in Salem Massachusetts, etc? What about XIX century American Christians persecuting and killing American Mormons? Let's not fool ourselves. I have read about them all. They are not even close in comparability. To suggest they are is ludicrous. There are certainly Christians that have done horrendous stuff. Again I suggest you read the references I provided. As far as the Crusades and other Medieval Church topics here is a good source by a historian from a Jesuit university, Thomas Madden of St. Louis University. There are other courses on the Inquisition, heresy and several other topics from the Middle Ages. He has also written several books. Unfortunately, the peaceful Muslim population has much more to fear from Islamic Jihadi terrorists and those who want to enforce Sharia law (with its executions and amputations, extreme discrimination of women (a very long list of injustices), and intolerance of conscience, free speech, and everything non-Muslim). The reason so many Muslim refugees want to come to America and Europe is to get away from other Muslims. So, the obsession in academia about Islamophobia is, in my opinion, a form of tacit support of the Islamic status quo and a denial of what truly ails the suffering Muslim communities. As to individual Christians and their peaceful Muslim neighbors, what is the call of the Gospel but to first love them and, second, to propose (not to impose) the better way of Jesus Christ - the only Way, Truth and Life of eternal salvation (as the Lord said himself - John 14:6). You wrote "They and their religion are cast as the source of terrorism . . " which, I believe, intimates that Islam has not been the source of terrorism, which is ridiculous. Radical Islam has killed people all over the world, and it does no good to hide one's head in the sand. I don't understand why good and decent Muslims do not rise up and reclaim their faith, but I see no sign of it. Christianity is for many in the West a veneer culture, not a true belief system. Over two millennia it has been taught poorly, distorted bizarrely, inculcated even worse, and gives rise through the ages to some of the cruelest behaviors in human history. The Crusades, colonialism, the Holocaust are a few of the outstanding examples drawing their energies in part from an arrogant vision of Christianity. What we see today in Western Europe and the United States are petty, but not minor, examples of the same. The list of Christ’s prescriptions in his own words, if you indeed believe in the veracity of the Scriptures, contradict the naysayers to this article. And no appeal by clerics to Catholic legalisms and hair-splitting can absolve us from following Christ’s prescriptions for a Christian life. Christ have mercy on us! The article states "Catholics must critically examine their own prejudices and stereotypes of Muslims." Christianity is the most persecuted religion in the world occurring daily to great loss of life and home and churches. Most of this is being done in the name of Islam! Although she acknowledges this to a certain extent Duffner then goes into pc mode with the term Islamophobia as if this was simply some visceral irrational prejudice that has to be overcome. There is real reason for fear especially when polls are done among Muslims about their desire to be governed by Sharia law and about radicalization in mosques or via Islamic websites. By the way: Catholic immigrants were not beheading people, bombing people, in the name of the Pope or the Catholic religion? That comparison on her part was absurd. Rather than a critical examination by Catholics there needs to be a critical examination by Muslims about this level of persecution of Christians and what's being done in mosques and Muslim communities to counter this? As a rule I'm not a fan of this craze for inventing new 'phobias'. Take 'homophobia'--have you ever met anyone who's AFRAID of homosexuals? I haven't, though plenty of people, myself included, believe homosexual behaviour wrong and would classify homosexuality as a mental illness. But 'Islamophobia'--that's a different case. Anyone who's studies history, or who's read the Quran, knows that Islam is indeed something we should be very much afraid of. And something we should actively resist. Are there good Muslims (like that nice couple in the picture)? Sure, just like there are good Mormons. There IS something innately good in people, even when they've been born into a religion that was started by a con man and which was founded on violence. But good Muslims are good in spite of their religion, not because of it. This article also appeared in print, under the headline "What Catholics owe their Muslim brothers and sisters," in the February 6, 2017 issue. Jordan Denari Duffner is a research fellow at Georgetown University’s Bridge Initiative, which studies Islamophobia. A former Fulbright scholar in Amman, Jordan, she is writing a book on Muslim-Christian dialogue for Liturgical Press.